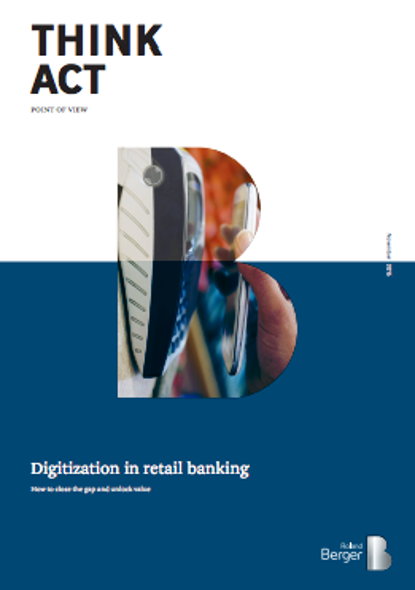 Digitization is underway at retail banks, although acceleration is necessary under complex circumstances. Digitization is a make-or-break transformational journey for banks. The results of Roland Berger’s second Executive Retail Banking Survey provide valuable insights into this digital transformation process through the input of top executives of 65 European banks from 13 different countries. Most European retail banks have completed the first wave of digitization, mainly focusing on client-facing applications to initialize basic transactions online but still struggle to close the loop for complex transactions, contrary to certain direct banks. Only 30% of European banks allow for initialization of basic transactions via smartphone. Belgian banks are slightly lagging behind in the digitization of their transactions, for example none of them support debit card or consumer loan applications via smartphone, compared to approximatively 25% of their European peers.